I can’t help but feel like the best way we can support Veterans is to pray for peace. When you get up from your prayer, do something like write a Christmas card, support the USO, hire a soldier coming home, or offer free babysitting to a family that is missing a parent. I never served in the military, but thousands of men and women before me did. To them, I am forever grateful. Today I served at a funeral at the Rock Island National Cemetery. The Rock Island National Cemetery is on an island on the Mississippi River. When you cross the bridge you are greeted with a security gate that always has at least two uniformed guards. When they are told that you are there for service for a veteran or a veteran’s wife, they come out of the little kiosk, snap to attention and salute all the cars that drive by. As we drove farther onto the island and then into the cemetery, anyone that we drove by stopped what they were doing and either gave a military salute or removed their hat and put their hand over their heart. Today, the island was particularly busy. Workers were all over the grounds preparing for Memorial Day. Every one of them paused as we drove by. I’ve done many services at national cemeteries before. All of them are emotional. Today though, was special. Flags lined the streets, and little flags were planted in neat rows alongside the stone markers. When kids in my parents’ generation were graduating high school, they were thinking about going to Vietnam. When kids in my grandparents’ generation were graduating high school, they were thinking about going to Europe or Japan. When I graduated high school, I was thinking about going to a party to try and meet a girl. Today I thought of the people I went to high school with that served in the military. They served for many reasons, and because they served, I didn’t have to. I wish I could say thank you to all of them. Today as I looked out at the lines and lines of markers, I said a prayer of thanksgiving. I thanked God for each of those markers, men, women, husbands, and wives that gave a part of their youth. They put everything on the line so that I could worship, speak, read, raise a family, pursue happiness, work for justice, and grow old in safety. Sometimes “thank you” just seems inadequate. One: Let us begin our time of worship with a moment of remembrance. All: We remember fallen soldiers, and the sacrifice they made for the sake of others. One: Let us begin our time of worship with a moment of thanksgiving. All: We thank God for brave men and women that have given their lives so that we may worship without fear. One: Let us begin our time of worship with a moment of silence; for a moment is the least we can do for those that gave their eternity. All: God of every nation, as we remember those that gave their life for our sake, let us be stirred to action in their memory. We confess that we have not done all that is possible to promote peace and justice in our world. We have not loved our neighbors, let alone our enemies. Forgive us for failing to live up to your commandments. Empower us to work for your Kingdom in this world, and welcome us by your grace into your Kingdom in the next. Amen. Click here to see a Veteran’s Day Litany, which can be appropriate for Memorial Day as well. Click here to read another reflection about Memorial Day and our struggle for peace. Thankful For Veterans. Praying for peace. One: God of love, peace and justice, it is your will for the world that we may live together in peace. 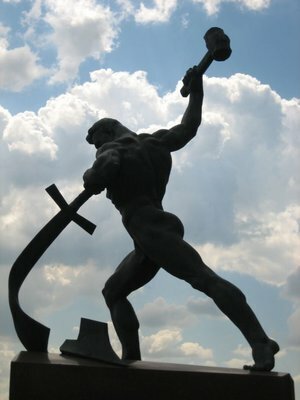 You have promised through the prophet Isaiah that one day the swords will be beaten into ploughshares. Yet we live in a broken world, and there are times that war seems inevitable. Let us recognize with humility and sadness the tragic loss of life that comes in war. Even so, as we gather here free from persecution, we may give thanks for those that have served with courage and honor. Please Rise: Those that are in our presence that are either in active duty or reserve duty, and the fathers, mothers, siblings, spouses and grandparents of those that are currently serving. All: God, we praise you for those that are willing to serve. 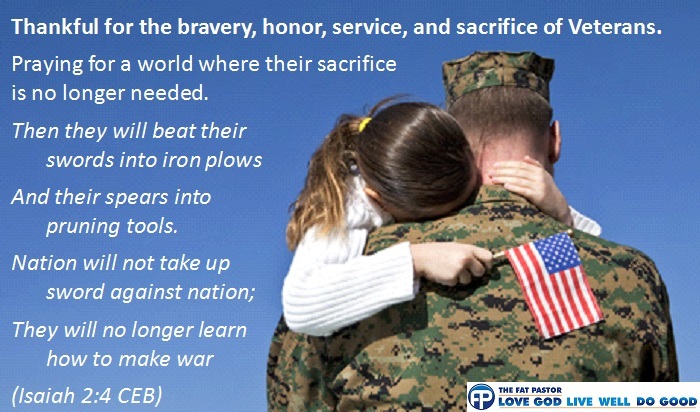 Let all Soldiers, Marines, Sailors, Airmen and Coast Guardsmen serve with honor, pride, and compassion. Do not let their hearts be hardened by the actions they must take. Strengthen their families. Keep them surrounded in your love and peace. Please Rise: Those that are in our presence that have served in the military in the past. All: God, we praise you for those that have served in the military. We thank you for those that put the welfare of others ahead of their own safety. Let us all be inspired by their self-sacrifice in service to those who needed protection. Please Rise: Those that are in our presence who have lost a loved one in war. All: God, we praise you for those that have made the ultimate sacrifice. We ask that you comfort those that still feel the pain of their loss. Keep us mindful that you have promised to comfort those that mourn. Please Rise: Those who have gathered in your name in safety because of the sacrifices of others. All: God, we praise you for granting us these freedoms. Let us honor those who have served by working for peace. Let us never forget those that have served, and let us never let go of your promise of peace. 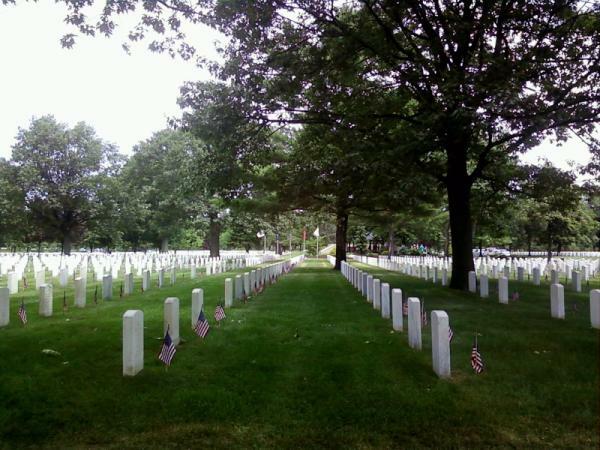 I also wrote this short Memorial Day liturgy. A reflection for Memorial Day. Sometimes “Thank you” seems inadequate. This litany was written by Robb McCoy. It is free to print or display for use in worship. Please attribute: “Permission to publish is granted by Robb McCoy, http://fatpastor.me.&#8221; If you use this in worship, I would love for you to let me know in the comments. Many people use the term Bible-believing as code for conservative, evangelical Christian. I do not consider myself to be conservative. I believe that the term evangelical Christian should be redundant (not a political affiliation), and I believe in the Bible. That is why on this day, as I think about those that have lost their life in wars, I turn to the Bible. A woman at church on Sunday told me that Memorial Day is a tough day for her, because she had seven brothers and uncles that went away to World War II, and “not all of them came back.” My heart breaks for this 92 year-old woman who, after all these years, still feels the pain of war. This morning when I hung my flag out in memory of those that have died, those that have given up more than I have dared risk, those men and women of every creed, race, and background, I said a simple prayer: “No more.” It is a prayer that will not be answered today. We live in a broken world. We live in a world where the ambitions and greed of a few can cost the lives of thousands. We live in a world where sons and daughters leave home to defend their loved ones, and often do not return. The world will be healed. It might not happen in my lifetime, but I believe in the words of the Bible, and I believe in the power of God to heal all things. Until then, I hang my flag with pride. Not because we live in a country that is perfect, but because we live in a country full of brave men and women that want to do and be better. Until it is healed, I hang my head. Not out of sorrow or despair, but in humility and prayer to a God that keeps promises. I believe in the Bible. I believe in this country. I believe in humanity that was created in the image of God. To those that have served, I humbly thank you.